Getting away for the summer is certainly more difficult these days, especially if you have a family. 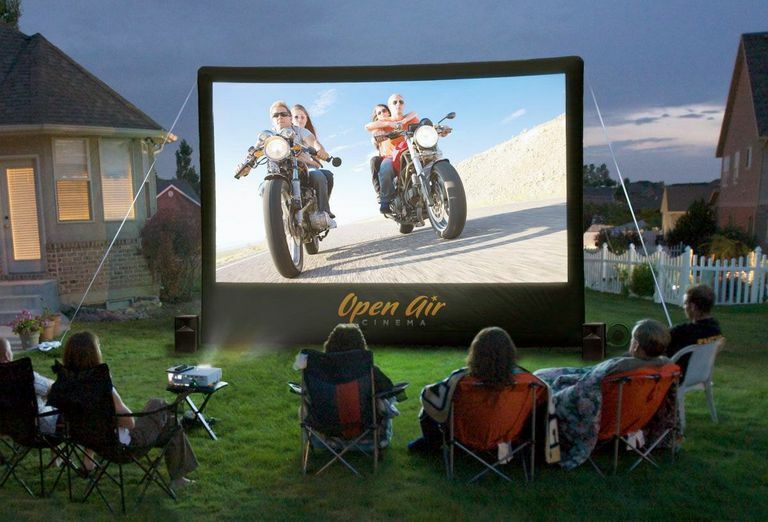 If you are facing discontent on the home front because of your inability to take your clan on summer vacation, why not add a little adventure and excitement at home on those warm summer nights by setting up an outdoor home theater? You can use one or two thick white king size ironed bedsheets. If you are using two sheets, sew them together (long sides joined) with white thread. The white sheet can be used as your movie screen. In addition to using a bedsheet-type screen, there are also other homemade alternatives that you can consider. Purchase a Ready-Made Screen - If making and hanging your own screen is too difficult, you can opt to purchase a large free-standing portable screen; some of these screens are as large as 100 inches. A pre-made screen will provide a better-projected image, due to its more reflective surface, but will also add additional cost to your setup, if you are on a budget. However, if you do plan to go with a pre-made screen, our advice would be to get one slightly larger than you think you need, as this will give you more flexibility in setting up both projector distance and desirable size of the projected image. Of course, as a last resort, you can also project your images on a wall. The wall needs not only to be white but reflective enough to contribute to a bright image. You may have to experiment, which may include some painting. If using a bedsheet-type screen, you can hang your screen on a wall, or hang it from a rain gutter, awning, or clothesline. You can also opt to use or make your own frame (similar to a square trampoline frame), only to be mounted vertically). You must also have a way to anchor or fasten the top, sides, and bottom of the sheet so that it remains taut and does not flap in the breeze. You may also need duct tape, clothespins, rope, or other fastening material to assist in fastening the sheets. If using a wall-mounted screen, make sure you have enough wall surface to insert needed hooks or other types of fasteners. If using a tripod, stand, or an inflatable screen, make sure you have a level ground surface, or platform, to place your screen. In order to watch a movie on your screen, you need a video projector. Video projectors can be expensive, but there are many "budget" projectors available that can do a serviceable job for about $1,500 or less (there are some good buys for less than $1,000). If you are a 3D fan, you have that option as well, but 3D will be more expensive proposition, as you need to take both the cost of projector, a 3D Blu-ray Disc player, 3D Blu-ray Disc movies, and the 3D glasses into consideration, which can cost from $50 to $100 per pair. Depending on the manufacturer, you may get one or two pairs with the projector, but if you expect several additional viewers, keep the extra costs in mind. It is also important to note that 3D works best with a projector that can put out a lot of light in combination with a very dark surrounding environment. In terms of adjusting the projector distance to the screen, experiment to see what looks best to you under the environmental circumstances. A lot depends on how large a distance you have to work between the screen and projector within your backyard as well. If you have about twenty feet to work with between the screen and back of your yard, this should be enough to find a good projector distance. Although the projector/screen combination is the best (and most cost effective) option for a large movie theater outdoor viewing experience, for a more intimate outdoor movie or TV viewing, you can also opt for a self-contained outdoor TV. There are several types and sizes of LED/LCD outdoor TVs available, typically ranging in size from 32 to 65 inches (but there are some larger sizes available). TVs made for outdoor use feature heavy duty construction that makes them weather and temperature resistant, and some are also rain-resistant. Also, to compensate for temperature variations, some also incorporate both cooling fans and heaters, which means they can be used all-year-round in many locations. In addition, outdoor-designed TVs also have anti-glare coatings so that, unlike video projectors, they can be viewed during daylight hours (most practical with a covered patio, slightly overcast day, or away from direct sunlight). However, keep in mind that these TVs are more expensive than an equivalent size or LED/LCD TV, and do not usually have extra features, such as built-in Smart TV or 3D capabilities, although there is a growing number that supports 4K display resolution. On the other hand, most do have a modest built-in audio system that may be sufficient for a small viewing area, but an external audio system is always suggested for a more home theater-like viewing experience. To watch a movie with your projector and your screen, you need a source; this should be provided by a Blu-ray Disc or DVD player. However, if you use a DVD player, an Upscaling DVD player would be better for very large screens. You have the option of buying one specifically for this purpose, with most upscaling DVD players priced at less than $59. This way, you don't have to unplug your main Blu-ray Disc or DVD player from your current home theater system. Another option you have is to use a portable DVD player or laptop computer with a DVD drive that also has a video monitor output for a video projector. Also, inexpensive portable Blu-ray Disc players start at about $79. DTV Converter Box - Video projectors do not have built-in TV tuners. If you want to include TV program viewing on your outdoor home theater, one possible option is to use a DTV converter box (the ones that normally allow analog TVs to receive digital TV channels) and an antenna. You connect the audio out of the DTV converter box to the audio system and connect the yellow composite video output of the DTV converter box the composite video input of the projector. However, this would not be high definition. Although the DTV Converter Box receives high-definition TV signals, they output those signals in standard definition. As a result, the projected image would not be as good as a DVD, and definitely not as good as a Blu-ray Disc. TV Antenna — If Using An Outdoor TV - If you are using an outdoor TV (which as a built-in tuner), rather than a projector, another option is to connect an antenna directly to the TV to receive local TV channels, or you can string a long RF cable out from a cable or satellite box from inside the house - but keep in mind that, depending on the length of the cable - quality will suffer. If both your TV and Cable/Satellite Box have HDMI connections, SunbriteTV offers up a Wireless Alternative for getting TV signals from an indoor cable/satellite box, to an outdoor TV. Media Streamer - If you have a media streamer media streaming functions included in a Blu-ray Disc Player), you can connect the media streamer to the video projector using the composite, component, or HDMI options if they are available.However, the tricky part is getting the connection of the media streamer to work with the rest of your home network. One way is to string a long Ethernet Cable. On the other hand, if you have a wireless network and your player has built-in or add-on wireless network connection capability (WiFi), this would be more convenient, provided your wireless network has enough range to go outside a short distance. Yamaha RX-V483 5.1 Channel Network Home Theater Receiver. You need something to provide the sound for your outdoor home theater. Although there are a small number of video projectors that have a built-in amplifier and speaker, the output volume is optimized for small room environments, such as business meetings and small classrooms, but will not do well in an open outdoor environment. Ordinarily, in a home theater, 5.1 channel surround sound is the desired goal. However, if you have an indoor home theater setup, you don't have to dismantle the home theater receiver in your main system, just to take it outside. For the purposes of keeping this project easy, even a simple two-channel stereo setup will work. I would go to one your favorite electronics dealers (Best Buy, Fry's, etc..) and purchase an inexpensive two-channel stereo or home theater receiver. Also, if you have upgraded your main home theater setup recently with a new receiver, you may still be in possession of an older receiver, which you can recycle for this project. As far as power ratings go, 75-100 Watts-Per-Channel should work fine. Here is where you have several options. You might just want to start off with some basic floor standing speakers. In fact, you may have some decent old speakers in your garage or home that you "retired" when you installed your current home theater system. In either case, this is a good starting point. You can also opt to purchase wall-mounted, in-wall, or outdoor speakers that blend in better with your backyard environment and are optimized for better sound outdoors. The speakers should be placed either at the top corners of the screen or midway between the top and bottom of either side of the screen (if wall mounted or in-wall) or below the left and right corners of the screen if the speakers are the floor standing type. In addition, if the speakers are floor standing or wall-mounted they should be angled in slightly towards the center to better direct the sound towards the listening/viewing area. I would experiment and see what speaker positioning works best. Outdoor Audio System Alternative - There is also another audio system alternative that you can take advantage of that does not require a stereo receiver and two, or more, speakers and wiring. Instead of a stereo receiver and two speakers, you can also opt for a simpler solution that can also work, especially in a temporary setup. The alternative audio system solution is to place your video projector on top of an Under TV Audio System (also referred to as Sound Base, Sound Stand, Speaker Base, Sound Plate - depending on the brand). Don't forget to include these items during setup. A TV Stand or Mobile Rack - To make it easy to move and place the heart of your backyard home theater system you need a TV stand or mobile rack of some type that has shelves or space to house your components (amplifier and DVD player placed on the lower shelves, and the video projector on top). You can either build your own or buy one at your local electronics dealer or home improvement center. Power Cord and Surge Suppressor - In order for everything to work, you will need a very long heavy-duty extension cord and a three or four outlet surge suppressor. I would recommend getting a twenty-five to thirty-foot heavy-duty type power cord, like the thick orange ones you can get at Home Depot.However, if you have outside power outlets along the house exterior or at key points in your backyard, you may be able to get away with a shorter one, depending on the distance between your components and the main power outlet used. Then, all you have to do is plug in your surge suppressor into the other end of the cord and then plug in your video projector, DVD player, and amplifier into the surge protector. Do not turn the surge suppressor on until everything else is plugged in, including speakers. Cables and Speaker Wire - You have to connect all your components together. Basically, you need S-Video, component video, or HDMI cables going from the DVD or Blu-ray disc player to the video projector and two analog RCA L/R cables (or digital optical cable if only that option is available) going from the DVD or Blu-ray disc player to your amplifier or receiver.Since all your components will be on the rack or stand, three or six-foot cable lengths between the components will work just fine; the shorter the better. Lastly, you still need two speaker wires going from the amplifier/receiver to the speakers. Our recommendation on speaker wire is to get a 100-foot roll of raw 16-gauge speaker wire at a local dealer (Such as Best Buy), and cut to the desired length needed for the distance from each speaker to your amplifier/receiver. If your speakers are In-wall mounted, make you make provisions to have speaker terminals on the wall's exterior that are easily accessible for temporary hookups. Movies - Gather up a selection of your favorite classic DVD or Blu-ray Disc movies. There are some great collections available on DVD, and now Blu-ray Disc, of Warner Bros and Disney cartoons, for instance. For additional movie suggestions, also check out our current favorite 2D and 3D movies available on Blu-ray. Food - There is nothing better to accompany your backyard home theater than some great food, especially BBQ. Enjoy the fruits of your labor. Also, if you aren't planning a BBQ or full outdoor meal, then have plenty of snacks available. Speakerlab Outdoor speakers and subwoofers. In addition to the video and audio components you need to set-up an outdoor home theater system, here are some additional tips that will help make your outdoor home theater experience a more enjoyable one. If you do place your projector inside of a rack, rather on top of it, make sure that the projector has plenty of air circulation from the sides or back. Compact video projectors can generate a lot of heat (despite having internal fans) and may temporarily shut down if the temperature of the bulb gets too high - you may have to add a supplementary external fan next to the projector to keep it cool. Make sure you invite your neighbors over or let them know what you are doing, so they don't get surprised by the noise. Also, offering food to your immediate neighbors might be a good idea to get them to go along with your outdoor home theater. If you live under the regulations of a home owner's association, please check your CC and R's for any restriction or notification procedures for such an activity. It is important to obey any community noise regulations and be sensitive to any reasonable complaints. Do not advertise or charge for anything. Regarding the public display of copyrighted material, you can't advertise to the general public (no fliers, banners, or neighborhood newsletter) and you can't charge admission for either the movie or food in a setting where a copyrighted DVD or Blu-ray Disc is being shown, without authorization from the Blu-ray Disc or DVD distributor. Your backyard is not a commercial movie theater.This also applies if you are showing content streamed from services, such as Netflix, and especially cable or broadcast TV sources (this means live sports). Just as with copyrighted DVDs and Blu-ray Discs, you have to get permission from copyright owners of streaming, cable, and broadcast content for public display. For more information regarding copyright and licensing, refer to the Motion Picture Licensing Corporation page, as well as informative FAQ from Swank Motion Pictures, an authorized distributor of films for public performances. Be sure to place your components well away from the swimming pool and BBQ grill. Be aware of humidity, smoke, water, etc. If you live in a southern state, where it can get very humid, you may not want to place your video projector on the top shelf of your rack, but, instead, inside, or on a lower shelf (this may mean you need a taller rack with an additional interior shelf). This will help keep moisture out of the video projector as it heats up. Check your environment for other factors that could inhibit the viewing experience, such as ambient light sources from street lights, backyard lighting, and neighbors' properties, as well as outside sources of noise, such as a competing party, airport, or wildlife nearby. Designate a storage space in your garage or house for your component rack, sheet, speakers, and power cord. This will make it easy to set everything back up during the Summer and on other special occasions.